Celia Rice Cleage Sherman is the earliest name I can call for this line. By the time I asked, nobody remembered her mother’s name. Celia Rice was born into slavery in Virginia about 1855. Sometime before freedom, she was taken to Tennessee. Celia had 4 sons, including my grandfather Albert, and 1 daughter, Josephine (also called Josie). MtDNA is passed from the mother, to the daughter, to the grandaughter to the great grandaughter in a straight line. Although sons receive their mothers MtDNA, they do not pass it on to their children. Their children will receive their own mother’s MtDNA. So, I am going to be talking about daughters of daughters in this post. 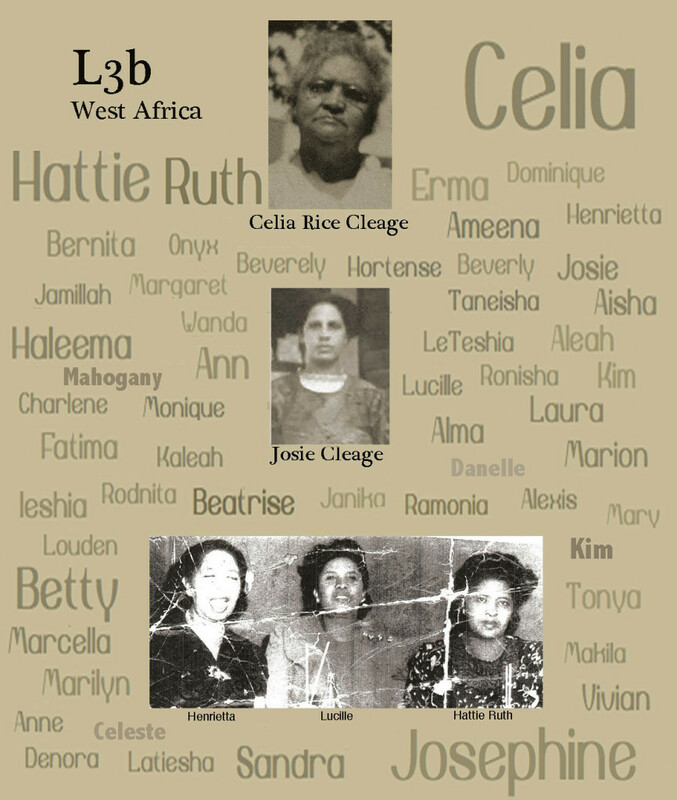 Celia Rice Cleage’s MtDNA passed through her daughter to her daughters, to their daughters and on and on and on. Josephine married James Cleage, (from a different Cleage family) and had 5 children, 2 sons and 3 daughters, Henrietta, Lucille and Hattie Ruth. My cousin Felix, a descendent of Hattie Ruth, shared a chart of family members with me about five years ago. There are probably more family members out there since then. Additions and corrections welcome! Henrietta had 1 son and 3 daughters, Margaret, Hortense and Ruth. I don’t have any information about their children. Lucille had 2 sons and 1 daughter, Mary, who had 1 son only. Hattie Ruth had 5 daughters, Vivian, Betty, Beverly, Marion and Erma. Vivian had 2 daughters, Josephine and Laura. She had 7 grandchildren, 11 great grandchildren and 1 2xgreat grand at the time I received my list.. I don’t know how many were daughters. Josephine had 2 sons. Laura had 5 children, 2 boys and 3 girls. She has at least 2 granddaughters. Betty had 3 daughters, 2 lived to adulthood. Sandra had 3 daughters, Bernita, Jamiliah and Aisha. Bernita had 5 daughters. Jamiliah had 1 son and 3 daughters. Aisha had no children. Charlene had 2 daughters and 5 granddaughters. Beverly had 1 son and 2 daughters, Tanya and Kim. Tanya has 1 daughter, Danelle. Kim has 2 daughters, Mahogany and Celeste. Marion had 2 sons and 2 daughters, Alma and Ruth Anne. There were 5 grandchildren, but I don’t know how many were daughters of daughters. Erma had 3 sons and 7 daughters, Beatrise, Marcella, Haleema, Fatima, Aleah, Ameena, Leshia. I don’t know the breakdown of her 16 grandchildren, but I know there were some granddaughters. Special thanks to my cousin Denora for permission to use the header photograph of Hattie Ruth’s daughters, granddaughters and great grands. And to Felix for the information in the chart. And to Tanya for getting her DNA tested. Family makes it happen. What a lovely chart with the names of all the daughters and daughters of daughters, proudly carrying your MtDNA on down the line. I hadn’t realized that sons can’t pass on their MtDNA. As it happened, on both sides of my family my parents’ generation had daughters and then many of my generation, including me, had only one son. My parents had two daughters and each of us had one son. So that means that my mother’s MtDNA will not get carried on to the next generation, at least, not in our line. Makes me feel sad. I know. I didn’t realize how many MtDNA lines in my family were being cut off due to boys only. Maybe you have some girl cousins in that line who had girls. In my family the YDNA has gone missing due to sons not having sons who have sons. The daughters have sons but that doesn’t help. Yes, you’re right, Kristin. Thank you for reminding me: I was being too narrowly focused on myself and my immediate family. On my mother’s side I do have two girl cousins with daughters , and they are both daughters of my mother’s sisters. One of those daughters has a daughter, too. On my father’s side, only one of his sisters had a daughter, and that daughter, (who, sadly, has recently passed away) had only a son. The idea of DNA “going missing” is distressing, but I suppose it happens all the time. I’d like to think that nothing ever really goes missing, but in fsct it does. I feel nostalgic about the Ydna in my family going missing. And I feel sort of sad that the surname Cleage is dying out, in my branch at any rate. There might be some unknown male descendents out there from missing siblings, but I don’t even have enough information to find them at this point. Perhaps you can start a campaign for women in your family to keep (or take back) Cleage and pass it on to their children. I kept my last name upon marriage (see “What’s In a Name? http://josna.wordpress.com/2012/12/03/165-whats-in-a-name/), but then I gave my son his father’s last name, so our surname will not be passed on in my branch of the family. I should have kept mine but I didn’t. I am using it online though. There was only 1 son who had sons and one of them had a daughter who kept her name. I’m not sure if she passed it on to her children. I hope they keep it going. Anyway, name, ydna, mtdna or not, we’ve still got their inheritance! Yes, that’s the right attitude! And if course, it’s the main reason we’re doing the work we’re doing—to praise, preserve, and pass on that rich inheritance.